An outbreak of cholera has exploded in the Artibonite region of Haiti. We have received reports that as of this morning, Friday Oct 22nd, there have been more than 2000 cases of acute watery diarrhea and already 160 deaths and mounting, at the facilities in St. Marc, Petite Riviere d’Artibonite, Mirebalais and Lascahobas; the death-rate of patients since Tuesday night has spiked to around 10 percent. This extremely virulent disease has also spread to the capital Port-au-Prince. In emergency mode, and as officials were just confirming the deadly outbreak, the LifeGivingForce team was on the ground in the seaside town of St Marc, to begin providing families there with desperately needed clean, safe water to stem the tide of the disease. In its response to the crisis, the co-ordinating body of the WASH cluster in the St Marc area, known as ACTED, requested that LGF assist in immediate efforts to bring clean drinking water to the affected area. This morning we sent our Haiti team to the region, about 45 miles north of the Port-au-Prince capital. The news we have on the ground is that the St Marc hospital is a horror scene. According to our sources, the inside of the courtyard is lined with patients hooked up to IV drips. Children are screaming and writhing in agony, while others are motionless. 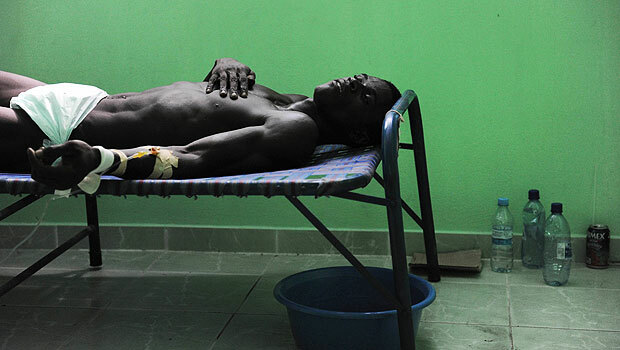 The hospital is completely overwhelmed by one of the fastest killers there is: Cholera. While representatives of all major NGOs attended the urgent WASH cluster meeting at St Marc this morning, approximately 250 local residents gathered outside angrily demanding clean water. The situation there is dire. LGF will set up an LGF mobile response water purification system capable of purifying 10,000 liters per day, providing clean drinking water to thousands of desperate villagers. Our systems rid the water of 99.999% of all known bacteria, viruses and cysts, through best-in-class UF barrier technology. Matt Walters, Program Director for LGF in Haiti stepped out of the WASH cluster meeting to take a call from the UN MINUSTAH CVR unit in Port-au-Prince, and received more unsettling news. Cholera has spread to the capital. The UN representative requested that LGF set up a number of our units there as well to try and stem the spread of this deadly disease. LifeGivingForce is responding quickly to this grave situation. LGF already has one of our LGF RR 1Ok units providing clean drinking water to 4,000 people per day in the Mirebalais community. We are working on getting as many of our units on the ground in the affected areas as we can in the shortest amount of time to save as many lives as possible. Please donate and help us get more life saving units on the ground in Haiti! This entry was posted in Features, LifeGivingForce Foundation, LifeGivingForce LLC and tagged cholera, clean water, Disaster Relief, Haiti, Life Giving Force, water filtration, water purification, water technology. Bookmark the permalink. Post a comment or leave a trackback: Trackback URL.